MURRAY, ALEXANDER, army officer; probably b. c. 1715 at Cringletie, Peeblesshire, Scotland, eldest son of Alexander Murray; d. 19 March 1762 at Martinique. By his wife Marianne, whom he married in 1749, he had three children, the youngest of whom he named James Wolfe Murray. Alexander Murray was commissioned ensign in the 17th Foot on 17 July 1739 and was promoted lieutenant in the 6th Foot on 19 Jan. 1740. He joined the 45th Foot on 19 April 1742 as a captain and was with the regiment when it arrived in Gibraltar on 17 June to take up garrison duties. Murray came to Louisbourg, Cape Breton Island (Île Royale), with the regiment in April 1746. When it was moved to Halifax in July 1749 he was in England, but he had rejoined it in Nova Scotia by December. He remained with it in the colony for almost ten years, during which time he built a house at Halifax and succeeded to the family estates at Cringletie on his father’s death in September 1755. 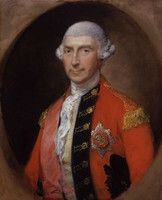 At first he commanded at Fort Sackville (at the head of Bedford Basin), but in September 1751 he was given command of Fort Edward (Windsor, N.S. ), where he remained for most of the ensuing seven years, except for a tour of duty at Halifax in 1753. 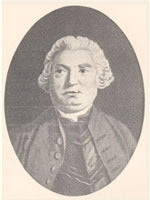 In the spring of 1755 he impounded the boats belonging to the Acadians of the Minas Basin, whom he suspected of violating Charles Lawrence’s embargo on the export of wheat. On orders from Lawrence, in June he confiscated their guns in case they might hinder Robert Monckton*’s planned seizure of Fort Beauséjour (near Sackville, N.B.). Following the decision of Lawrence and his council to expel the Acadians from Nova Scotia Murray supervised the deportations from the immediate area of Fort Edward. During October 1755 he sent off 1,100 persons in four ships. Murray was promoted major in the 45th on 1 Oct. 1755. The regiment took part in Jeffery Amherst*’s expedition against Louisbourg in June 1758, and during the initial landings at the Anse de La Cormorandière (Kennington Cove) Murray had joint command of the four grenadier companies which formed the left wing of the attacking force. He continued to command grenadier companies throughout the siege. He remained at Louisbourg until May 1759 when, with the local rank of lieutenant-colonel, he left at the head of three companies of “Grenadiers of Louisbourg” to take part in Wolfe’s campaign against Quebec. During the siege he led the grenadiers in an unsuccessful attack against French positions near the Montmorency River on 31 July. He subsequently commanded on the Île d’Orléans. The Louisbourg grenadiers under Murray fought on the British right flank during the battle of the Plains of Abraham (13 September), and according to a family tradition the keys of the city were formally surrendered to him. After wintering at Louisbourg Murray was transferred on 25 Feb. 1760 to the 55th regiment and by August he was encamped with it on Staten Island, New York. He was with the 48th when it sailed from New York on 19 Nov. 1761 to take part in a campaign against Martinique. He suffered from an attack of yellow fever shortly after his arrival on the island, but he had apparently recovered completely when he died suddenly on 19 March 1762. Murray, who liked to be “thought a good soldier,” won Wolfe’s “great regard” and was considered by Amherst to be “a very good and useful officer.” When during the siege of Quebec dissension among the officers was beginning to grow bitter, Murray reported to his wife, “I meddle with no politicks or party, am well with all, and, I am told, a Favourite of the whole Army; I go by the name of ‘the old Soldier.’ “From the many letters that he wrote to his wife and family while at his various posts he emerges as a conscientious professional soldier, a keen observer, and a deeply religious and affectionate husband and father. A portrait of Murray can be found in Sherwood Foresters Regimental Annual, 1924 (London, 1925). PRO, Ind. 5436, f.120; 5438, ff.355–56; WO 1/1, ff.354v–55; 1/5, ff.15, 209–10; 12/5718, f.32; 12/6470, f.22; 34/3, ff.17–19; 34/19, ff.17–18, 34–34v; 34/55, ff.114–14v. [Alexander Murray], “Letters of Colonel Alexander Murray,” Sherwood Foresters Regimental Annual, 1926 (London, 1927), 181–220; 1927 (London, 1928), 240–68. Army list, 1740, 30. Knox, Historical journal (Doughty). Brebner, New England’s outpost. Russell Gurney, History of the Northamptonshire regiment, 1742–1934 (Aldershot, Eng., 1935), 53–54. H. C. Wylly, History of the 1st & 2nd battalions the Sherwood Foresters, Nottinghamshire and Derbyshire regiment, 1740–1914 (2v., London, Frome, Eng., 1929), I, 5, 8–9, 16, 20, 34, 40–42, 45–46, 48. “Colonel Alexander Murray,” Sherwood Foresters Regimental Annual, 1925 (London, 1926), 117–22. John Humphreys, “MURRAY, ALEXANDER (d. 1762),” in Dictionary of Canadian Biography, vol. 3, University of Toronto/Université Laval, 2003–, accessed April 24, 2019, http://www.biographi.ca/en/bio/murray_alexander_1762_3E.html.